X-Caliber Tactical is an authorized reseller and distributor of Piper's Precision Products. Regretfully due to unforeseen circumstances, Piper's Precision Products has canceled plans to offer the M2 HB in 8mm and as a gas operated airsoft gun. However there's talks about a possible 6mm version utilizing the proven and powerful Polarstar gearbox system! Please contact us at sales@xcalibertactical.com or call 512-524-2621 for all inquiries. 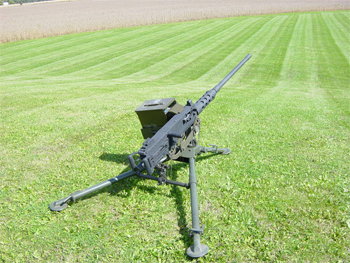 X-Caliber Tactical is offering M2 HB Belt Fed Machine Gun Non-Firing Replicas. They are identical to the metal body shown illustrated in the photos of the prototype but are non-function and do not contain any working firing components. Perfect for re-enactors or display. Please contact us at sales@xcalibertactical.com or call 512-524-2621 for all inquiries. 10/11/06 - P3 Airsoft M2 HB Prototype Revealed! X-Caliber Tactical is proud to reveal the Piper's Precision Products Airsoft M2 HB Heavy Machine Gun to the general public. Paul Piper of Piper's Precision Products AKA P3, the creator behind the Strafer airsoft/airguns and Vulcan miniguns, has developed this wonderful replica and functional 8mm airsoft full automatic gas operated machine gun to fill a missing role in airsoft military simulation gaming - the heavy support weapon. The outer body is manufactured by Irac Inc. (www.iracinc.com) and is made of steel and aluminum for a very realistic feel and weight. The dimensions are very close to the genuine Browning M2 Heavy Machine Gun or "Ma Duce" or "Fifty-Cal" as affectionately called by U.S. Military Forces. Irac Inc. will be the official supplier for the bodies for the production P3 M2 HB airsoft guns with P3 supplying and installing the internal firing system and external box magazine. Like previous P3 engineered air weapons, the M2 relies on a tired and tested external gas system that can be CO2 or High Pressure Air or an Air Compressor (150 PSI, CFM 20-25 is likely to be the recommended for optimal performance). The M2 HB has an adjustable cyclic rate of between 100-600 RPM through the use of inline flow control and is capable of firing between 200 - 500 FPS. It utilizes a highly efficient sealed valve system which only uses gas when the weapon actually fires, so there is no loss of gas pressure like in some traditional gas blowback airsoft products which sometimes utilizes gas to operate bolts or slides. In fact, the M2 R&D prototype has been field tested at 450 FPS using .45g 8mm airsoft BBs in conjunction with a 5lb CO2 bottle and reliably cycled over 5,000-rounds without expending the entire CO2 contents. The M2 HB has a DB Customs™ 8mm Tightbore barrel for impressive range and accuracy and features an adjustable hop-up that allows for fine tuning of the groupings of various weight 8mm BBs for various ranges and velocities. The prototype has been tested currently to ranges as far as 80 yards with flat trajectory impacts, but further testing is needed before the maximum range is known. 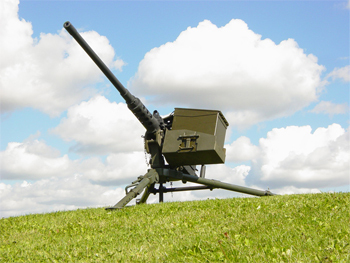 An electrically powered 2,000-round external box magazine shuffles 8mm BBs and is housed inside a genuine U.S. military surplus .50 ammunition box which can be placed on the ground or on a cradle mount to the left side of the receiver. The loader can reliably feed BBs no matter where the ammunition box is placed nor how the weapon is elevated or swiveled in respect to the ammunition box. It utilizes a stainless steel coil spring that connects to the weapon and shuttles the BBs internally inside. 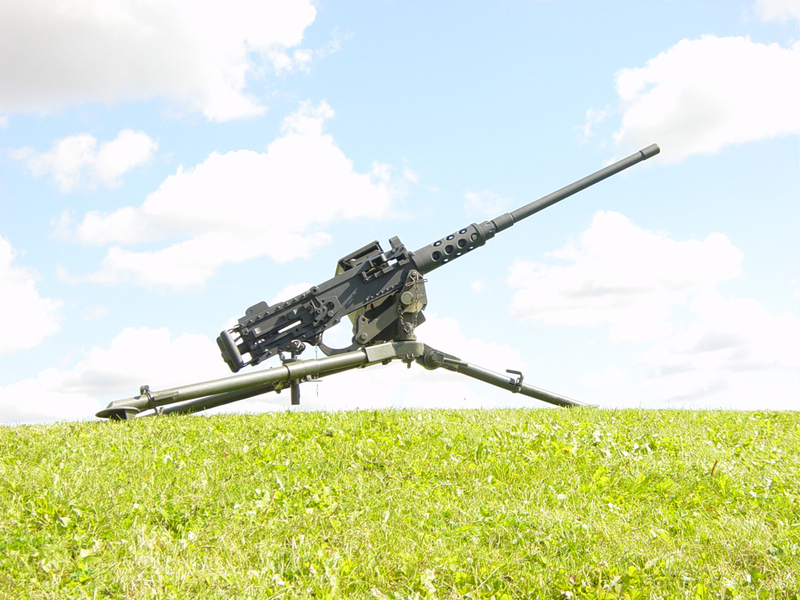 In testing, it reliably loaded BBs into the weapon over a distance of seven feet through an aluminum tube elevated over four feet over the loading system. Also a carefully engineered clutch assembly in the loader also prevents BBs from being loaded into the weapon faster than it depletes the rounds and the loader only function when the M2 is fired. Depressing the M2's trigger releases the air into an internal valve as well as completes a circuit to activate the loader. Thus every time a BB is fired a new round is shuttled into the receiver automatically. The ammunition box also conveniently stores a 20oz CO2 bottle and helps to make it look more authentic to genuine Browning M2 HB set-ups. As development continues, further information will be posted and production is anticipated for later this year or early 2007. X-Caliber Tactical encourages interested parties to contact them so to better judge the customers' needs and determine the quantity of units to be built. At this time its unknown if this will be a limited production item and the cost has yet to be determined, but the target goal is between $2,800 - $3,200 per unit. Please also note that neither X-Caliber Tactical nor Piper's Precision Products have plans to sell nor manufacture M3 tripods or M2 specific pinion and cradles or other various mounting systems. We will do our best to provide leads and locate such items on behalf of the customer, but we will not be selling them directly nor stocking them. Interested parties are encouraged to contact X-Caliber Tactical. More information will be posted as the R&D continues. Due to the extensive rate of fire, law enforcement and military personnel are encouraged to exercise and heed the following: For less-lethal use, velocities should not exceed 425 FPS for typical engagements and should not be used at close range if possible. Do NOT aim for the center of body mass or head area. 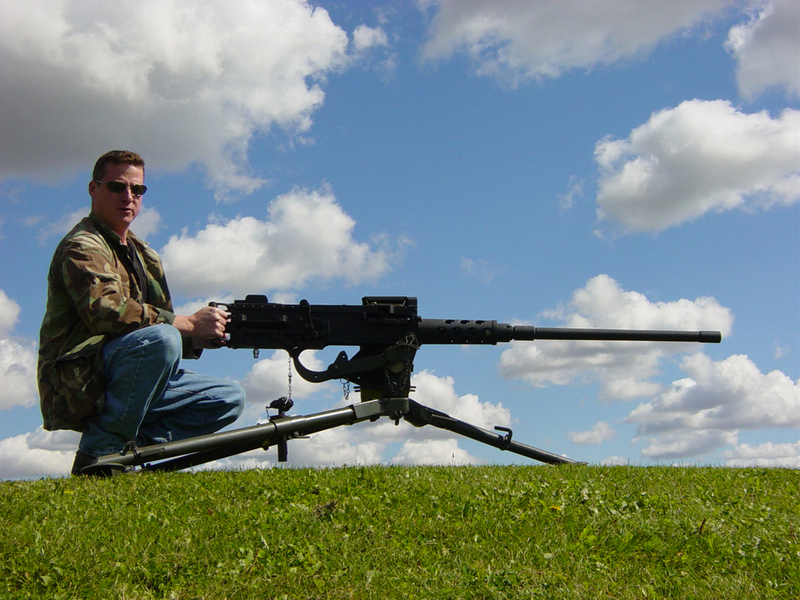 The M2 .50 Cal Machine Gun is capable of inflicting serious or possible fatal injury! Aim for the lower extremities and when firing and keep the muzzle moving in a constant side-to-side motion across the target so to minimize tight clustering of the BBs directly onto the target to minimize possible injury. Fire ONLY short bursts! Long bursts may wear through a target and may inflict serious or possible fatal injury. NEVER use metal BBs for less-lethal use!! Use of metal BBs may inflict serious or possible fatal injury! Piper's Precision Products nor X-Caliber Tactical CANNOT be held responsible for any accidents or incidents due to misuse or neglect or use of the minigun in the less-lethal role. 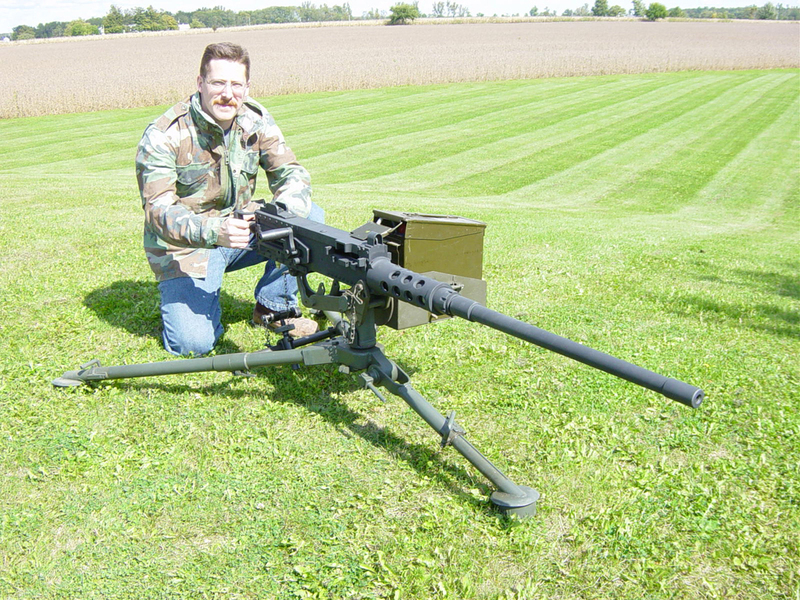 Click here to see our Airsoft M2 HB .50 Cal Machine Gun videos on YouTube. This product is considered an airsoft or BB gun and thus is not typically subjected to any typical FFL restrictions and is legal in all countries, states, and cities that permit ownership of airsoft or BB guns. Buyers however are suggested to consult their local codes and must be over 18 and are required to sign a legal waiver. This waiver must be downloaded and a signed copied must either be scanned and emailed to sales@xcalibertactical.com or faxed after contacting us indicating your intent to purchase. We accept payments by way of personal check, money orders (all checks must clear prior to orders being shipped) or we take Visa, Master Card or Discover Card over the phone.